Situated in a prime location, Emerald City Condos, The Peak – The Point – Lumina is an astonishing addition to the master-planned Emerald City community. 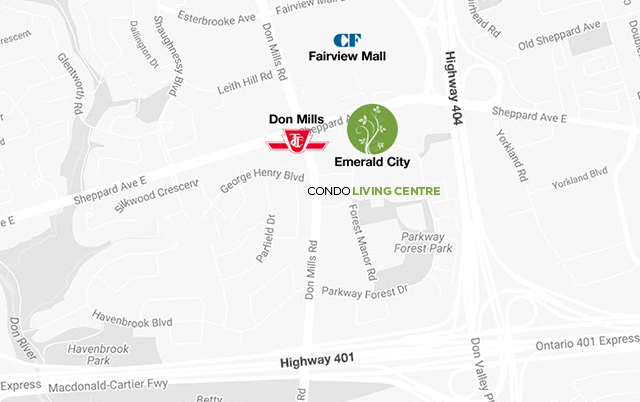 With Fairview Mall and Cineplex at close proximity, easy access to the DVP and 401 Highways, many nearby parks and schools, minutes away from the Don Mills Subway Station and a short distance away from the North York General Hospital. What Are The Emerald City Condos Features? Great Investment Opportunity: Those investing in the Emerald City Condos are investing in a master planned community. That being said, prices are estimated to rise as the area continues to develop. In addition to that, the University of Toronto Scarborough campus is a short 12-minute drive away, making this a perfect location for students to rent from. The potential for an increase in investment is definitely made possible. Emerald City Condos Toronto is a pre-construction condo project by Elad Canada. Elad Canada takes pride in creating the special developments with highest integrity and quality. 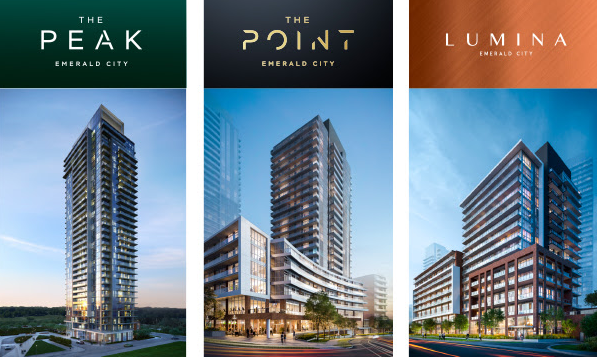 Elad Canada Condo Projects: Peak Condos, Lumina Condos, Point Condos, Fifth On the Park Condo, Park CLub Condos & The Colours of Emerald City. *This offer is available for a limited time and subject to change without notice. It has no cash value. Certain exclusion and conditions may apply. $5000 is due upon signing of the Purchase Agreement, the balance of 5% within 30 days, a further 5% in 2020 and 10% due at interim occupancy. The offer does not apply to prior purchases and may not be combined with any other offer/promotion in effect. This offer may be terminated at anytime without notice. Prices, incentives, specification, deposit, sizes, floor layouts, promotions and the units availability of the condominiums are subject to change by the builder without any notice. E. & O.E.